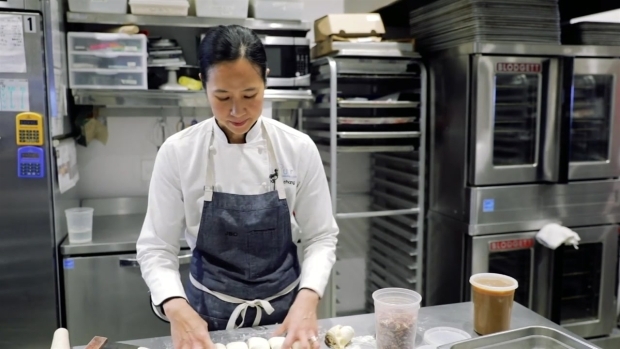 Joanne Chang sat down with NBC10 Boston to discuss her food, career and bucking expectations. For Joanne Chang, the owner of Flour Bakery + Cafe, the measure of success is simple. “We’re really hoping that everyone who comes in, comes in and leaves happier,” Chang told NBC10 Boston at the bakery’s location at the Innovation and Design Building in Boston's Seaport. Flour has earned legions of fans with its gooey, melt-in-your-mouth sticky buns, delicately-poached egg sandwiches and addictive banana bread. Since the original location opened in the South End in 2000, Chang has opened seven more across the area. In 2016, she won the James Beard award for Outstanding Baker. Despite the accolades, a career in the culinary arts wasn’t always a certainty. Chang, who grew up in a traditional Taiwanese-American household, was encouraged to pursue a "stable" career path. Baking did not meet that criteria, despite her obsession with the craft. Joanne Chang at six years old. After studying applied mathematics at Harvard University, she took a job as a management consultant -- a career path she quickly realized was not for her. So she bet on her lifelong passion, quitting her job and finding work in a kitchen. After working her way up through restaurants and bakeries in Boston and New York, Chang was ready to open her own shop. We spoke with Chang at Flour to discuss her career, the Boston food scene and bucking expectations. Q. What kind of experience do you want people to have at Flour? A. I know this sounds crazy, but I want it to be the best experience you’ve ever had. I want you to walk in and to be struck by the sounds, the smells, the visuals; I want you to be welcomed by the team members and wowed by all the pastries. 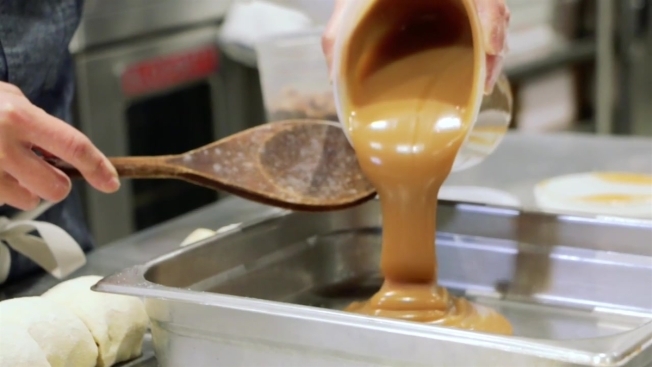 Celebrity chef Joanne Chang demonstrates how to make Flour Bakery's famous sticky buns. Q. How did you come up with the name for Flour? A. Flour is a simple, iconic word, and we’re just trying to give people the simple pleasures that amazing food and service can bring. We didn’t want a fancy word, a word that people wouldn't be able to remember, we wanted something that was truly classic and that people would recognize. One of Chang's first jobs in the restaurant industry was at Biba, a now-closed restaurant in Boston's Back Bay. Q. How did you come to enter the food industry? A. The food industry was not something I had ever thought about growing up or even in college. I dabbled a little bit in college, baking chocolate chip cookies for the dormitory grill as a break from all the problem sets I had to do. After two years of consulting all of my colleagues were going off to business school or moving up in the company and I didn’t want to do either of those. I thought to myself, ‘I spend all of my time in the kitchen, playing around, reading cookbooks, going out to eat and thinking about food. Maybe I should spend the next year or so working at restaurant to see what that’s like.’ I fell in love. Q. How challenging was it to buck the expectations of a stable career path? A. There were a couple of times in my first cooking job where I thought, ‘Man, I made this crazy mistake and I need to go back into consulting or find something else to do.’ But I really loved being in the kitchen, and everyday I went into work even when it was super hard. I also felt kind of at home, and that’s what sustained me that first year. After about a year or so, it became what felt comfortable to me, it really felt like what I was supposed to do, and because of that my parents saw that I was much happier than I had been, and that really helped in allowing them to accept that I had taken a different career path. Chang, with, from left, her husband, mother and father. Q. Do you recommend building a career by getting in over your head? A. I think if you’re interested in the food business, there’s no better way to find out if it’s meant for you than to actually do it. I think sometimes (people) think they can jump into owning a bakery, but there’s so much to learn before you get to that point. The lessons you learn working in restaurants and bakeries, if you’re meant to be in the food business, they will help you sustain yourself so you can stay in it. Q. What’s your go-to comfort food spot in Boston? A. Cafe Sushi in between Central and Harvard Square. We go there all the time and love it. The owner, Seiji, has been running it for 9 or ten years, but the restaurant has been around for like 30 years. Q. What are the hurdles facing the food scene in Boston? A. Rents are extremely high; it’s really hard for restaurants that operate on tiny margins to be able to survive paying really high rents. Transportation is tough. For anyone working at night, if you can’t get out by the last T, then you're stuck taking an Uber or cab and that’s really expensive. Then housing: it’s really hard for people to find reasonably affordable places to live, which makes it hard from an employer’s point of view to find staff to actually staff your restaurant. Q. Can we look forward to a new book? A. I am finishing up my next book Pastry Love, which comes out in November. I think of its as journal of all my favorite recipes, things I’ve done in past, things we’re doing now. I revisited some recipes from my other books, and I’ve updated them over the years and so I offer them up in Pastry Love. A. The mom test is actually based on my mom. When we opened the bakery, my mom moved in with me and worked at Flour for three or four months just to be a helping hand. Everything I baked off, I would put on the pasty counter. She worked at the counter and she would sell it to the guests. I was really important to me that everything I made, she would be proud of to present to the guests. Q. Your social media accounts are filled with people telling you that your food improved the outlook of their day. What’s the most memorable compliment you’ve received? A. Any time someone says, ‘I was in a crappy mood, I came in, I got a sticky bun; your team smiled at me; I had a really great sandwich and then I left and was super happy,’ I think for me that’s super memorable. Any time anyone tells me that, I feel like we’re doing the right thing and we’re on the right path.